Sticks to smooth, rough and uneven surfaces. Fix, patch, seal, hold and protect almost any surface with a crystal clear appearance. Weatherproof - water, UV and temperature resistant. 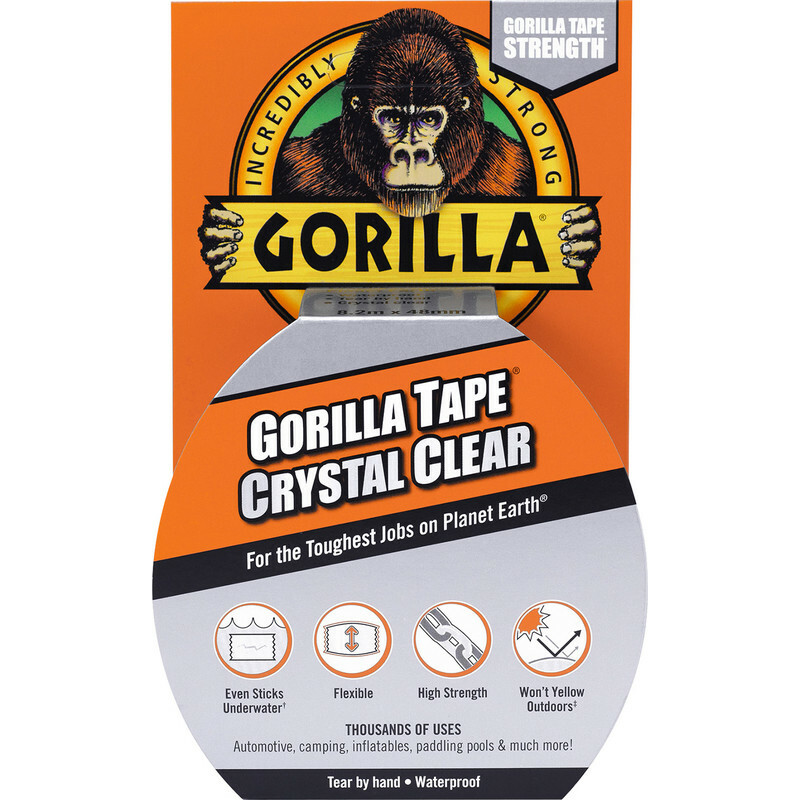 Gorilla Crytsal Clear Tape 48mm x 8.2m is rated 4.9 out of 5 by 36. Rated 5 out of 5 by Roy2 from Great repair tape Used Gorilla clear adhesive tape to repair several cracks in a caravan front window (plastic double glazed unit). Very impressed with strength of the tape and its adhesive qualities. Not an invisible repair, but nice and clear. Time will tell, but so far doing a good job at keeping the water out after recent heavy rain and hail showers (April). Can recommend and would buy again. Rated 5 out of 5 by KevGG from Great product I bought this as an emergency repair for a broken headlight, it worked a treat kept me on the road until I could replace it. Rated 5 out of 5 by Christaki from Does the job! Bought this to repair our heavily vandalised polytunnel. The tape is very easy to manipulate and did a fantastic job of waterproofing and securing the cover. Worth it's weight in gold. Rated 5 out of 5 by James72 from Good clear tape. A good tape which is easy to tear off roll but sticks well to surfaces. Rated 5 out of 5 by Marcus1 from Great! Great service all round, thanks TS! Rated 5 out of 5 by Cornish Jim from Gorilla Clear Tape Does exactly what is says on the roll, also on TV ads etc. Very strong but totally clear. Brought it to repair floor vinyl ripped by kitchen chair foot. Can hardly notice it, just slightly shining. Roll cost a bit expensive but 'You get what you pay for! '.